This infrared snapshot of a region in the constellation Carina near the Milky Way was taken shortly after NASA's Wide-field Infrared Survey Explorer (WISE) ejected its cover. It was released Jan. 6, 2010. A sea ofstars takes center stage in the very first photo released from NASA?s newestspace telescope built to map the entire sky. 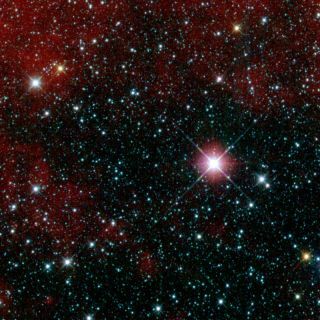 About 3,000stars are visible in the new sky image from the Wide-field Infrared Survey Explorer(WISE), a space telescope launched to seek out elusive dark asteroids, new planets,odd brown dwarfs and other cosmic objects. The photo covers a patch of sky inthe constellation Carina that is about three times the size of the full moon asseen from Earth. While WISEwas also built to hunt for galaxies that are invisible to optical telescope butshine ultra-bright in the infrared, the first images do not include any ofthose unusually bright objects. Such targets could damage the telescope?sdelicate detectors if WISE stares at them for too long, researchers said. Thisphotograph is one of several engineering pictures beamed to Earth by WISEafter the telescope ejected its protective lens cap last week. They are beingused to calibrate the space telescope to make sure it takes the sharpest imagesof the sky. WISE isdesigned to take a snapshot of the sky once every 11 seconds as it orbits theEarth. To make sure those pictures come out clear, the telescope has aninternal scan mirror that can move to counteract WISE?s motion during itsorbit. "Rightnow, we are busy matching the rate of the scan mirror to the rate of thespacecraft, so we will capture sharp pictures as our telescope sweeps acrossthe sky," said WISEmission project manager William Irace at NASA's Jet Propulsion Laboratoryin Pasadena, Calif.
WISEresearchers have said the space telescope will generate the most detailedinfrared maps of the universe to date. To do that, the telescope?s infrareddetectors are kept at a chilly minus 445 degrees Fahrenheit (minus 265 degreesCelsius), or about 8 degrees Kelvin. But WISEonly has a limited amount of super-cold coolant onboard. That supply will runout in October, when the mission is expected to end, researchers said. WISE?sfirst sky survey should be complete in about six months, with a second tofollow through the fall. A preliminary look at WISE?s sky maps is expected inApril 2011, with the final cosmic atlas due out in March 2012. But aselection of choice images collected during the survey will be released earlierbeginning in February, mission managers said.